Appalachian Trail: Georgia "Where it all begins"
March 29th, 2011 Starting my A.T. Thru-hike at 9:15am with just one other brave soul in the parking lot. How do I describe starting a journey into the unknown? Nervous excitement would describe it best. After months of training and researching I am finally beginning this much anticipated trip, and much like diving into the water for the first time while petrified of drowning, those first steps into the woods in Georgia where equally parts freeing and terrifying. 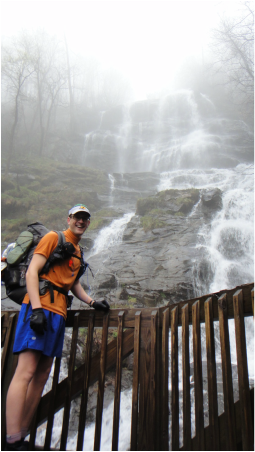 My adventure began by getting up at 4am for my flight into Atlanta, getting on a train at the airport till the very last stop, and then getting picked up by the folks at the Hiker Hostel in Dahlonega and driven another hour into the middle of nowhere. Filled to capacity with well over two dozen hikers, I quickly got myself situated, and mentally prepared myself for the adrenaline rush that would be finally stepping onto the trail. Amicalola Falls on the 40* morning of March 29th. Surprisingly enough, my first steps in the Georgia woods weren't on the Appalachian Trail (A.T), they were instead on the 8.5 miles long Amicalola Falls approach trail leading past the tallest waterfall in Georgia, at over 725 feet tall. 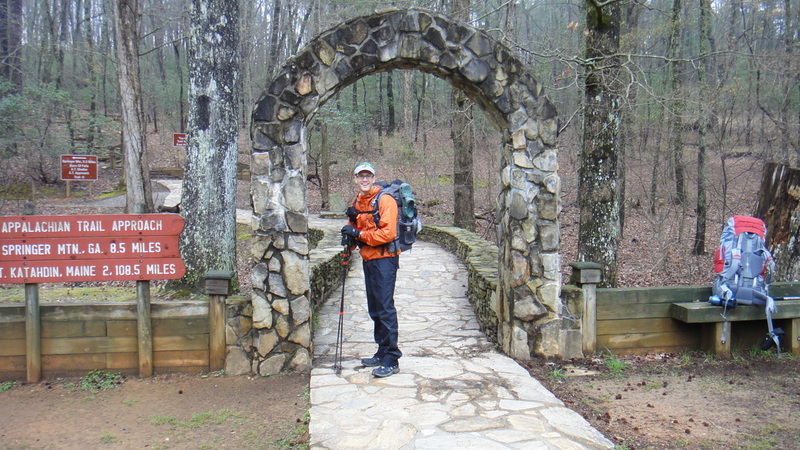 Assuming that I would never again attempt to thru-hike the Appalachian Trail, I had decided to try and explore as many small side-trails and scenic views along the way that I could. Taking the approach trail past the falls was my first opportunity to do so, and it didn't disappoint. The car full of hikers that came from the hostel with me had all opted to start at the parking lot right near Springer Mountain, and so I alone stepped out of the van and wrote my name in the visitor's center logbook "CTWhistler, March 29th, Pack Weight of 24 lbs with 4 days of food and 2 liters of water". As the 525th thru-hiker to sign into the log book alone (most don't even come to the visitor's center and bother signing in) I knew that there would be plenty of company for me on the trail. "Alone in the woods" takes on a whole new meaning during March and April along the Georgia A.T., and eagerly snapping photos as I went, I headed out for my 16 mile long first day of hiking. Here is a slideshow of the highlights of my time in Georgia, the people, the shelters, and the views.